Living life on the road can be taxing, especially for those just starting out in the trucking industry. However, in today’s digital world, there are tons of mobile apps for truck drivers that could make life on the road just a little bit simpler. Whether it’s a weather app, or an app to track gas prices, there is something out there for every single one of your trucking needs! Here are some of our favorite mobile apps for truck drivers that we think you’ll benefit from having on your phone. 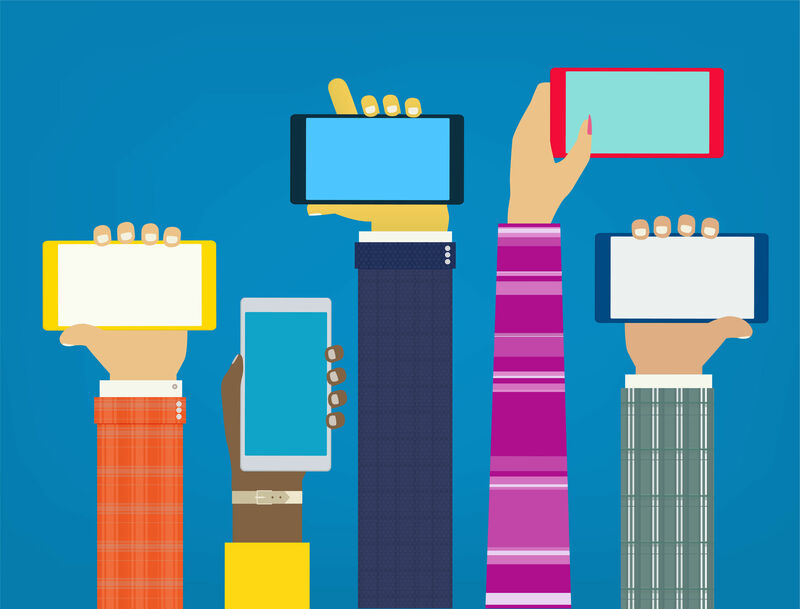 Interaction hands using mobile apps. Camscanner is a mobile app that functions as a scanner on the go. You can snap a picture of any receipts, documents, important papers, etc. and it will save all of your images to the cloud. This allows you to access your images from any device, and also allows these documents to be emailed to or shared with anyone you want. Due to the fact that most companies ask drivers to keep track of their expenses, whether it be per day or per week, this app could be a lifesaver. While not the most fun app out there, it could be really useful not only for keeping track of your receipts but also for keeping your cab clean! No more receipt piles or rough arguments with your supervisor. GasBuddy is one of the most useful mobile apps for truck drivers out there. It is an app that allows drivers to compare gas prices in their area. You can use either their app or their website to find price comparisons by typing in your zip code and what type of gas you’re looking for. While sometimes you might not have a choice in where you stop for gas, when you can be choosey, GasBuddy is definitely the best app for you! Along the same lines as GasBuddy, RoadHunter is a complementary app that could really take a lot of the burden off your shoulders when trying to plan out your stops. RoadHunter shows you where the nearest truck stop is and what type it is (Pilot, Love’s, etc. ), but the truck stop information doesn’t start there! RoadHunter also gives you information about whether or not the truck stops have showers, restaurants, and/or parking available. All in one app! This app will also show you where the weigh stations are on your route, something that can really help when planning routes. RoadHunter will even provide you with severe weather updates! While severe weather doesn’t necessarily affect your scheduled deliveries, drop-offs, etc., it does affect the time it will take you to get there. Keeping an eye on the weather can be really beneficial to you. While it kind of goes without saying, having a weather app on your phone can be very handy when you’re traveling. One of the least talked about mobile apps for truckers is The Weather Channel app. The Weather Channel is one of the most reliable sources for all things weather and can be especially helpful on the road. By allowing push notifications, this app will be able to give you real-time weather updates and alerts if there are any warnings out. If you have free time on the road and enjoy listening to podcasts, then we have the apps for you! If you are an iPhone user, you likely will already have the iTunes app on your phone or tablet so you’re all set. However, if not, you could also check out Google Podcast! Podcasts are a great way to entertain yourself while on the road and you’ll learn a lot from them too. We even have our own trucking podcast for you to listen to! 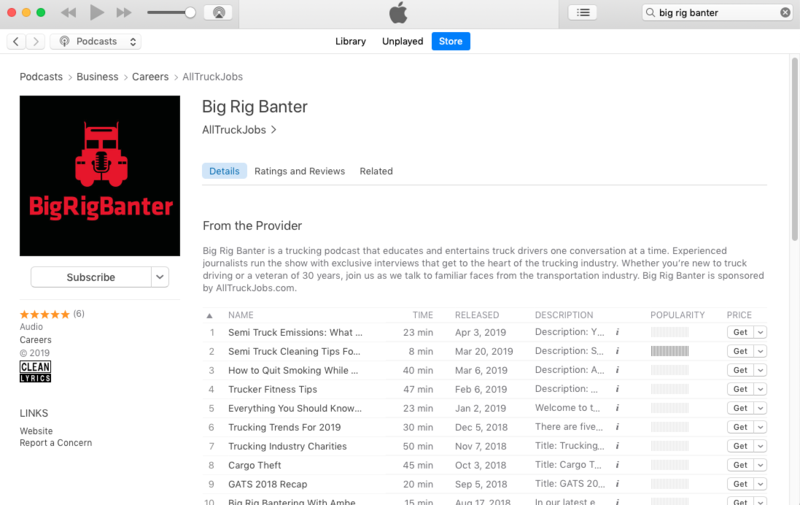 It’s called Big Rig Banter, a sister brand of AllTruckJobs, and you can find it on Google Podcast, iTunes, TuneIn and coming soon… Spotify! Make sure to give it a listen if you have some downtime while on the road. We promise it’s worth your while! Big Rig Banter podcast on iTunes. What are some of your favorite mobile apps for truck drivers? Do you have one you use every day? Feel free to let us know in the comments! Thank you so much for introducing these apps. The apps that I use the most while on a long haul are FleetSaver Mobile and Gasbuddy. Former blocks calls, SMSs and other messages for a time period and the latter shows where your nearest gas station is. Sleep Regulations for Truckers: A Dream or A Nightmare?